Owning a horse farm comes with its share of joys and challenges. A variety of flies and pest can bring diseases and other medical conditions onto the horse ending up costing you money in treatment. Horses suffer silently from pests like mites, blister beetles, lice, ticks, mosquitos, bots, flies, and gnats. Flies are the most common ones and can be harmful to the horse. You can get rid of this nuisance by using the best horse fly sprays available on the market. Miracle Coat No Fly Zone for Horses, 12 oz. With the Ultrashield, your horse will get weatherproof, and sweat-resistant spray made to last more than 17 days. The insecticide works so hard to keep flies away and can also be used on dogs. It contains two sunscreens for the health of your horse’s healthy hide. It is very advanced and ranks ahead of the competing products. It kills and repels mosquitoes, therefore, keeping your animal safe from infections like West Nile virus. Since it is impossible to seal off our horse in a completely fly-free area, you can use Endure fly spray to accomplish the task. It is sweat-resistant, making it effective for a longer period. The formulation makes it work even in wet conditions like rain and sweat. 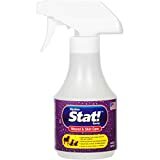 With this excellent spray, your horse will be safe from the danger and nuisance of flies among other pests. It allows the horse to stay active without worrying about the wet conditions. It is designed to provide up to 14 days of protection and is the only product with RepeLock conditioner which works by binding the hair shafts. It repels and instantly kills deer ticks and quickly knocks down mosquitoes. The Bronco Equine is a must for every stable. It is very effective at killing ticks, gnats, six fly species, fleas, deer tick, lice, and jiggers. The water-based formula is ready-to-use and comes with a pleasant citronella scent. 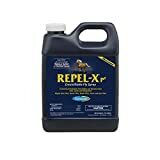 It can be used in barns, stables and on ponies and horses to control flies and other pests that may transmit diseases or make the animal uncomfortable. The EPA registered fly repellant contains essential oils, making a gentle yet very effective spray for your horse. It is pesticide-free and has a coat conditioner and sunscreen making excellent at repelling flies while controlling skin problems. It can safely be used in barns, stables and on the horse. It can be purchased in the 5:1 concentrate or a ready-to-use formula. It contains several essential oils including citronella oil, cedarwood oil, and eucalyptus oil. The pyrethrin-based horse spray formulation can be applied directly to the animal’s body to repel flies. The ready-to-use product also provides a high sheen for a beautiful appeal when the hair brushed. Just one to two ounces is enough to protect the horse. Using this fly repellant is economical and effective at keeping your horses safe and comfortable. It repels and kills various pests like mosquitos, ticks, gnats among others. Mix a quart it with 8 quarts of water, and you are good to go. Protect your horse with this gentle EPA registered fly repellant. It contains essential oils, sunscreen, and coat conditioner to treat insect-related problems on the skin. Get up to 14 days of protection from flies to give your horses the much-needed comfort from bites. It includes relock conditioner and is sweat-proof. The US made fly repellant is the best solution for your horse fly problem. This fly repellant has a non-toxic formulation making it excellent for use on the animal. It is gentle and does not irritate. It can be used in the stable area for maximum benefit. The formulation lasts long after application. Using Stat spray enhances wound healing and other skin conditions. The moisturizing formula includes Aloe Vera to soothe hot spots and itching. It effectively promotes hair growth without any sign of discoloration. The spray includes antimicrobial and antifungal to keep your horse healthy while the eucalyptus repels insects. These products are the best for your horses or cattle for controlling flies. By regularly spraying them, you are protecting the animals from diseases and other health issues that may come from flies. The list will help you choose the Best Horse Fly Sprays depending on your budget, the horse’s needs, and preference. They have all been given high ratings by other customers and can work for your horse’s special needs.